We've got the first of our Super Chunkies in the shop! A new 50/50 wool.acrylic blend from Rico in super bright shades and some neutrals too. It has an impressive 100m per 100g, its very soft and it is extremely satisfying to knit with! Super Chunkies normally use 10mm needles, which normally means quick results. We're putting together a collection of patterns perfect for beginners and those who want a quick knit... First up is a beginners scarf - using 2 balls of our Super Chunky. 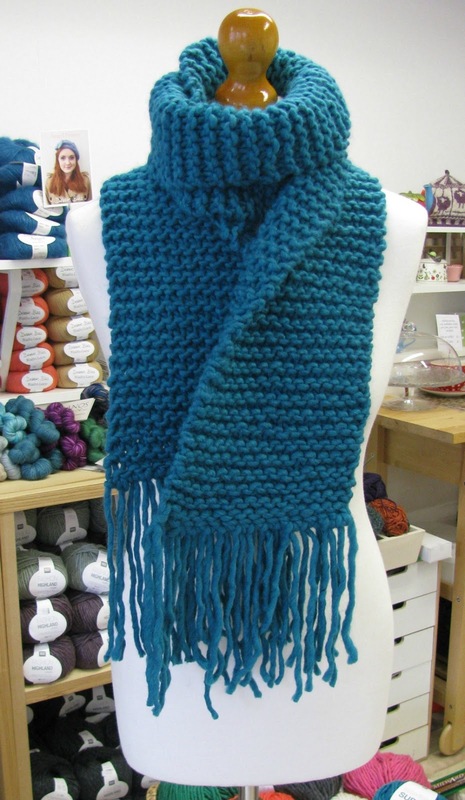 We think this would be a great beginners project - cast on and knit every row - but it's not a neverending scarf - this super thick yarn knits up very quickly! You only need 2 balls and the pattern even includes instructions on how to add fringes. Perfect for gift giving too!